Since the end of the Second World War, the bourgeois historiography has tried to distort various incidents in order to vilify Socialism and the USSR. One of these incidents- which has been a "banner" of imperialism's apologists and other anticommunists- is the so-called “Molotov-Ribbentrop Pact”* which was signed in 1939. In it's unscientific, unhistorical effort to equate Communism with Nazism, the bourgeois propaganda presents the Molotov-Ribbentrop pact as a medium of expansive policy by the USSR and Hitler's Germany. The distortion of historical events, the amalgamation of lies and the half-truths by the Imperialists and their collaborators aim in defaming the huge role of the Soviet Union in the anti-fascist struggle of WW2. However, the reality is different than the one presented by the bourgeois historiography. Here, we will examine the circumstances and the events which led to the Molotov-Ribbentrop non-agression pact, in an effort to debunk the anti-communist propaganda on this matter. Having the financial and technical support of US and European monopolies, Hitler's Germany began to strengthen its armed forces in the mid-1930s. In 1936, the Nazis proceeded to the militarization of Rhineland, helped Mussolini in capturing Abyssinia (Ethiopia) while they played a crucial role in the imposition of Franco's fascist dictatorship in Spain. The strengthening of Nazi Germany and the beginning of fascism's expansion in Europe took place under the tolerance of the then powerful “democratic” imperialist powers; Britain, France and the US. After the annexation of Austria into Nazi Germany in March 1938, the Allies (Britain, France) proceed to the Munich Agreement (30 September 1938). The apologists of Imperialism usually try to downgrade the importance of this agreement between Britain, France, Mussolini's Italy and Hitler's Germany. However, the impact of the Munich agreement- an act of appeasement towards the Nazis- was definitely significant. With the signatures of the then British and French Prime Ministers, Neville Chamberlain and Édouard Daladier, the Nazis annexed Czechoslovakia and intensified their expansionist aggressiveness towards Eastern Europe. Neville Chamberlain, Eduard Daladier, Adolf Hitler, Benito Mussolini. A few months later, on April 7, 1939 the fascist regime of Italy invaded and captured Albania. 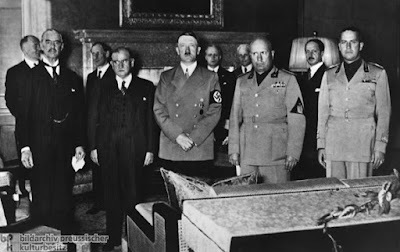 On March 31, 1939, the governments of Britain and France guaranteed the protection of Poland in case of a Nazi attack- Both London and Paris signed bilateral agreements of mutual aid with Poland. When Germany invaded Poland on September 1st, 1939, Britain and France declared war against Hitler but without taking any military action until next year! From their side, the United States declared their neutrality. Before the invasion of the Nazi army in Poland, the government in Warsaw had tried to negotiate with Hitler a possible joint attack against the Soviet Union. The negotiations failed, as long as the Polish bourgeoisie prefered instead to sign defense agreements with Britain and France. What is important here is that Poland had rejected an agreement of mutual defense (against Nazis) offered by the Soviet Union. The Imperialist propaganda tries to obfuscate Britain and France's stance of appeasament towards the Nazis and hides the reasons behind the US “neutrality”. The words of US Senator Robert A. Taft are characteristic: “A victory of communism would be much more dangerous for the United States than a victory for fascism” (CBS, 25 June 1941). 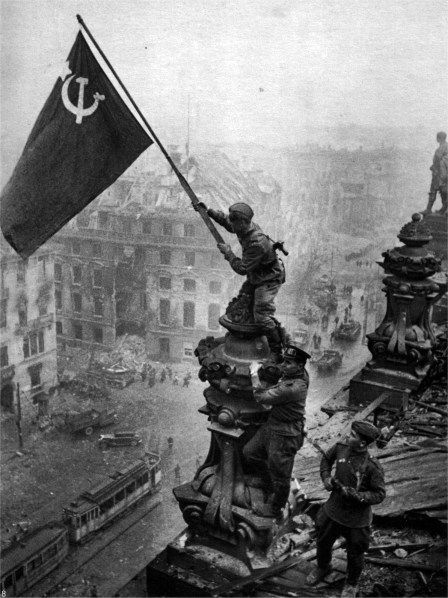 According to historian John Snell, the western powers regarded the Third Reich as a “barrier” against the Soviet Union in central Europe. The strategic aim of the “democratic” imperialist states was to turn Hitler against the Soviet Union; in a few words, to use the Nazis as a weapon against the contruction of Socialism in the USSR. That was the initial aim of the so-called “allies”. On that point, we must remind that, before the war and while Hitler's regime was building a powerful military, the Soviet Union took numerous initiatives in order to deal a defensive agreement with the European capitalist states. Despite the Soviet calls for the preparation of a common front against the Nazis, the western European “allies” declined such a perspective. For example, before the 1938 Munich Agreement, when Hitler annexed Austria, the Soviet Union proposed an International conference (March 1938) which would deal with the confrontation of Nazi agressiveness. On July 23, 1939, the Soviet Union proposed to Britain and French the beginning of negotiations for the formation of a defense plan in case of a German attack. However, the British government had other priorities: to secretly negotiate a non-agression pact with Hitler's representatives in London. Indeed, while the Soviet Union was proposing to the capitalist states an anti-fascist front, the British government was secretly negotiating with the Nazis the “spheres of influence” in Europe! What the bourgeois historiography deliberately hides is the fact that the Soviet Union was the only state that had not an aggressive, expansionist policy. 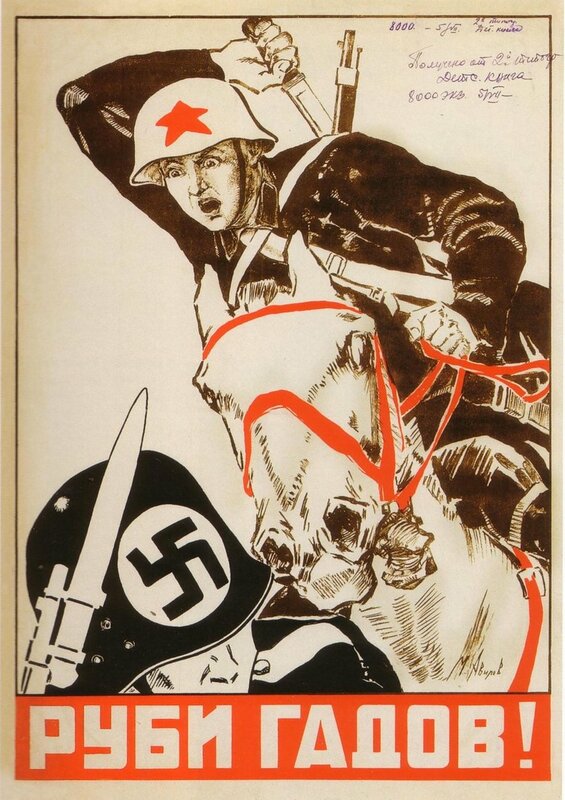 Both the two sides of international imperialism (the “democratic” capitalist allies and, on the other hand, the Nazi-fascist Axis) were aiming at the elimination of the Soviet Union. The real enemy of both sides was the Socialist construction in the USSR and for that they didn't hesitate to use each other against Moscow. The temporary non-agression pact between the Soviet Union and Germany came after numerous efforts by the Soviets to deal a defense agreement with Britain and France. Therefore, being under the continuous threat of the expanding Nazi army and in order to prepare itself for an extensive war, the Soviet state forced to sign the non-agression pact with Berlin. What the bourgeois historians and the apologists of Imperialism call an “alliance between Hitler and Stalin” was in fact a needed diplomatic manoeuvre by the Soviet Union in order to gain time and prepare effectively for a full-scale war. Even bourgeois historians admit that the Soviet policy was complete realistic, given the then circumstances and the danger of a German attack (F.Dulles, The road to Tehran, New York, 1944, p.203-207). According to the imperialist propaganda, the Molotov-Ribbentrop non-agression pact led to the Soviet “capture” of a part of Poland and the Baltic states of Estonia, Lithuania and Latvia. Such arguments- about the supposed “Soviet occupation”- have fostered the rise of fascist, neo-Nazi groups in these countries after the counter-revolution in the USSR. However, the truth is also quite different. Poland had participated actively in the allied imperialist attack which was launched against the newly-founded Soviet state in 1918. With the Treaty of Brest-Litovsk (3 March 1918) the Bolshevik leadership had renounced Tsarist claims to Poland. The Polish government kept under it's control a number of areas in the Baltic region, including western Belarus, western Ukraine and a part of Lithuania). After the Nazi invasion in Poland in 1939, the Red Army moved towards the Soviet-Polish borders and liberated the abovementioned areas. The bourgeois-imperialist propaganda tries to distort history when it refers to “Soviet occupation”- on the contrary, the Soviet Army was the one which liberated the Baltic countries and eastern Europe from the Nazis. The Motolov-Ribbentrop pact did not include any kind of Poland's “partition”. On the contrary, the 1938 Munich Agreement between Britain, France and the Axis (Germany, Italy) led to the partition of Czechoslovakia and the seizure of the country by Hitler's army. The imperialist propaganda regarding the Molotov-Ribbentrop pact consists one of the numerous cases of blatant anticommunist lies. Through bourgeois historiography, Imperialism tries to equate communism and fascism, to vilify Socialism and the Soviet Union. In order to do this, Imperialism's apologists distort history and invent the most hideous slanders against the Soviet Union and the socialist states; from the “Moscow trials” and the “gulags” to the supposed “Stalin-Hitler alliance” and the “Soviet invasion” in Afghanistan. What the Imperialists want to hide is the fact that fascism is just another kind of bourgeois authority- the simple fact that, as Bertolt Brecht said, fascism is the “most naked, brazen, oppresive and deceitful form of capitalism”. * The Soviet-German non-Agression Pact took it's name from the surnames of the two Ministers of Foreign Affairs who signed it: Soviet diplomat Vyacheslav Mikhailovich Molotov (1891-1986) and Nazi Minister Joachim von Ribbentrop (1893-1946). Nikos Mottas is the Editor-in-Chief of 'In Defense of Communism', a PhD candidate in Political Science, International Relations and Political History.